Sweet Potato Gratin with Goat Cheese, Parmesan, and Thyme is perfect for Thanksgiving, and this is for people like me who prefer savory sweet potato recipes! The recipe is low-glycemic, meatless, gluten-free, and South Beach Diet friendly. Use the Thanksgiving Recipes to find more Thanksgiving recipes like this one. 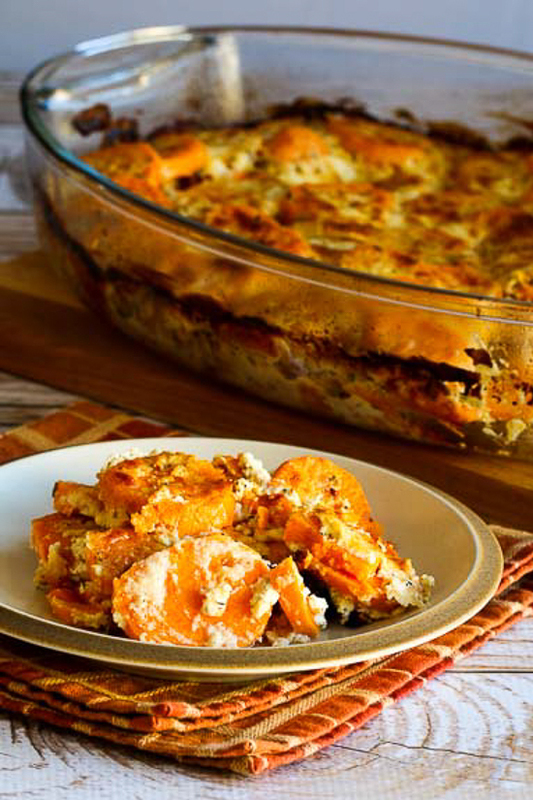 Click to PIN Sweet Potato Gratin with Goat Cheese, Parmesan, and Thyme! Sweet Potato Gratin with Goat Cheese, Parmesan, and Thyme! It’s time to start narrowing down your Thanksgiving menu, right? For people who are keeping it as low-carb as possible, I’ve given you 25+ Low-Carb and Gluten-Free Holiday Side Dishes, Appetizers and Salads as well as The BEST Low-Carb and Gluten-Free Thanksgiving Side Dishes, so if sweet potatoes are too high in carbs for you, go check those out! But I love Savory Sweet Potatoes and for a special holiday meal I wouldn’t pass up a small serving of this Sweet Potato Gratin with Goat Cheese, Parmesan, and Thyme. When I tested this recipe twice, (once with Jake and once with Kara), we absolutely could not stop eating these creamy sweet potatoes! And if I had to pick my one favorite sweet potato recipe on the blog, it would have to be this one! Sweet Potato Gratin is a holiday treat, so it’s a little more indulgent than the usual things you find on this blog. I love the combination of cheese and cream (or half and half) that gives such creamy flavor here, but the recipe also has a lot of healthy low-glycemic sweet potatoes. And it’s also gluten-free for anyone who needs that! And this could be assembled earlier in the day (or even the day before) and then cooked when it’s dinner time. And just a note about recipe formats. When I introduced you to the new-and-improved Kalyn’s Kitchen I mentioned how recipes had to be edited by hand to switch them to the new recipe format like you see in this recipe. I am spending a lot of time doing that, but I can tell it will be months (maybe years) before I’ll have all the 2,000+ recipes on the site switched over. I’m bringing it up because I’m getting comments and e-mails saying “I don’t see a print button.” For older recipes there’s still just a printer-friendly link after the recipes that takes you to a printable page with only the recipe. Then you use the regular print function on your computer to print the recipe (File/Print or Control/Print on most computers.) Thanks for your patience! Whisk together the softened goat cheese, thyme, and half and half. Spread half the goat cheese mixture over the sweet potatoes. Top that with half the Parmesan. Make another layer of seasoned sweet potatoes, goat cheese mixture, and Parmesan. Bake covered with foil in a pre-heated 375F/190C oven. Then remove foil and bake 20-30 minutes more, or until the top is nicely browned and sweet potatoes are soft when you stick a fork in. When I shared this on Instagram people immediately starting asking for the recipe; enjoy! Layer half the sweet potatoes in the baking dish and season well with salt and fresh-ground black pepper. Spread half the goat cheese mixture over the sweet potatoes and sprinkle on half the grated Parmesan. Make another layer each of sweet potatoes seasoned with salt and pepper, goat cheese mixture, and Parmesan. Cover the dish tightly with foil and bake 1 hour (or until the sweet potatoes are quite soft when you stick a fork in them.) Remove foil and bake 20-30 minutes more, until the sweet potatoes are very soft and the top is nicely browned. Serve hot. Recipe created by Kalyn with recipe testing help from both Kara and Jake. Sweet potatoes are probably too high in carbs to make this Sweet Potato Gratin with Goat Cheese, Parmesan, and Thyme suitable for strictly low-carb eating plans. And admittedly this is kind of a rich dish for the South Beach Diet, but sweet potatoes are a healthy low-glycemic ingredient choice, and I’d eat this for Phase 2 or 3 for a Thanksgiving indulgence, or for an occasional treat. I have made this several times, and I always prepare the dish a day ahead. I bring it to room temperature the following day, pop it in the oven and it comes out great. It has become a Thanksgiving staple. Everyone loves it. Deborah, great idea to make it ahead! So happy you have enjoyed it! For some reason, my family doesn’t love sweet potatoes, so I’m always looking for new ways to cook them that just might appeal to my picky eaters. I’m adding this recipe to my list! Lydia, this is so good for anyone who likes the savory flavors of goat cheese and Parmesan. Maybe that will win them over? This sounds absolutely wonderful. And I’d probably veer away from my purple potatoes and purple sweet potatoes to make this (I can tell you that purple mashed potatoes are weird, even though they taste good). I’m not doing a fancy TG dinner, but am definitely saving this recipe. Hope you enjoy, and I do agree that orange sweet potatoes would be best for this! Do you think it would be good with Feta cheese instead of Goat? I usually prefer feta to goat. Oh yes, I think Feta would be fantastic in this recipe! My wife made this just now. Taste good. But I think she put too much cheese in it. You can certainly use less cheese if you prefer. Yes. It tastes better with lesser cheese. Everyone has their own preferences, so I am glad you were able to adjust it to fit yours Bill. Made this last night for Easter. It was freaking FANTASTIC!! Thanks for all you do here. As I said in the recipe, I haven't tried assembling in advance and cooking later, but I'm guessing it would work. You could also probably cook partially and then heat when you serve it, but I haven't tried that either so I can only guess that it would work. I'm guessing that because it's really good reheated, but if you try it I'd love to hear how it works. And if you have the option of cooking right before you eat it, that's probably going to give the best results. Tyler I haven't tried it but I am guessing that if you like the tanginess of buttermilk it would be great in this. I'd use the same amount. I'd love to hear how it works if you try it. Has anyone tried substituting buttermilk for half and half? If so, how was it, and did you use the same amount? Alice, great idea to make it in an 8X8 dish for a smaller crowd. So glad you and your guests have enjoyed it! I have made this a few times now. It is always a surprise hit at parties, because people are not expecting the savory flavors. I usually make 1/2 recipe, which works well in an 8×8 glass dish. Thanks for the great recipes, Kalyn. Thanks Katie, hope you enjoy! This was so amazing! Thanks for letting me have some. I ate the leftovers for dinner and they were amazing! Thanks Karen! It was so great to see you; glad you enjoyed the leftovers! I'd love to see a few gluten free and dairy free recipes. It's hard to find good recipes for Thanksgiving that don't involve either one. My site is loaded with recipes that are both gluten-free and dairy free. Scroll through the Can Be Paleo category to find them. I really wasn't sure what to make for Thanksgiving this year…I was thinking sweet potato casserole and I love how this is savory instead of sweet! Definitely a contender. Joanne, we went seriously crazy over this when we tested the recipe! Looks fantastic! Will give it a try and report back:-) Thanks. Thanks Anna; hope you enjoy! Thanks, we seriously did love it! Is it no longer possible to save messages to a recipe box on your site? Did I lose all my saved ones? I wrote a reply to you right away, but now I don't know why I don't see it here. Hope you were not worried. The recipes are still there; you can access them from the Recipe Box link in the right sidebar. Ziplist is closing down the recipe box feature (not me!) You should have received an e-mail at the e-mail address you signed up with explaining how to move your recipes. They will be available until December 10. You can read the message from Ziplist at that link if it's not in your e-mail. I have only heard from two people about this (counting you) so I don't know if I will post about it, but here's a post from my friend Lydia with some more suggestions. Hope that helps. I am sad that they shut down, but I can't do anything about it. Love the combination of sweet potatoes and cheeses! I'm not hosting Thanksgiving this year, but if someone asks me to bring a side dish, I'll make this one. Lydia, I hope you will enjoy it as much as we did!